This article was written by University of Southern California Assistant Coach Jason Hart. There are a number of reasons why a team might run a zone. Maybe they don’t feel like they can match-up with the opposing team. Maybe they feel it is time to switch up the defense and give the opposition a dose of something else. Whatever the reason may be, a 2-3 zone (if ran correctly) can be a defense that you can use pretty much at any point of the game to help your team get vital stops. In this article, I am going to talk about some of the nuances of a 2-3 zone and other important points to think about when implementing your 2-3 zone. This will allow you to be able to fine-tune your 2-3 zone defense and better have success when you implement it against the competition. I played at the top of the 2-3 zone for four years at Syracuse. All of the teams that I was able to be a part of had good size and length, especially on our back line. We had guys that could really deter shooters and challenge shots. This is not the end-all-be-all, but it definitely helps. Either way in the zone you are going to give up 3’s, you just want to make them as tough as possible. If you have players with size, length, and athleticism like we did, you already have a head start towards creating a lockdown 2-3 defense. Everyone thinks because you are in a zone that you no longer have to defend the ball or apply any pressure to the ball handler. Regardless of what defense you decide to run, dribble penetration will break it down every time. Guys who understand this and take pride in defending the ball will help immensely in your zone. It is important though that this is something that every player is held accountable for. Playing a zone does not mean less accountability; it means more accountability and learning to work together with the other four defenders on the floor. The ball is at the Top of the Zone (Guards): Someone must have the ball at ALL times, the ball cannot go unaccounted for. The other player at the top is going to be responsible for protecting the middle area and doing their best to prevent the ball from being entered by a pass. The ball is at the Top of the Zone (Wings): Both wing players are going to be in what is called “50.” This will depend on personnel, but they are going to be midway between the block and the offensive player. When the ball is reversed and “in flight” that specific wing player will close out on the ball and defend it until “bumped” over by one of the top guards in the zone. Middle of the Zone: The middle should be covered by someone at ALL times. Basketball is not a perfect game though, so the ball will make its way there at some point. When the ball does enter middle by way of the pass, it now becomes the middle defender's responsibility. However, he SHOULD NOT step up and fully commit and allow the drop down pass for a layup. What the player needs to do is “stunt” until a wing player can drop down and cover. Once the middle defender is aware that a wing defender has dropped down to cover, they can fully commit to the middle and guard the player with the ball. This takes a lot of trust and practice for the middle defender because their first inclination is to take the ball right away. Man-to-Man Principles: Players tend to lose focus in a zone because they are no longer in a “man-to-man” defense and responsible for guarding a specific offensive player. The faulty thinking is that the same rules of man to man no longer apply because it is a zone defense. However, this couldn’t be further from the truth. A lot of the same man to man principles still apply, and it is up to you as the coach to make sure that you are emphasizing those as you build your 2-3 zone defense. Boxing Out: When it comes to boxing out you no longer have a specific man that you are responsible for. Instead, you have someone in your area that you are responsible for making contact with, boxing out, and then finishing the play with a rebound. This sounds simple, but you will see players every day not turn and block out, instead they will turn and look at the basket. It is up to you to make sure that players are being held accountable for boxing out and finishing the play every time. Intensity: Some players fall into the thinking that because you are going to a zone the intensity can drop off and it will still be okay. This type of thinking couldn’t be further from the truth. Nothing should change in your approach to defense regardless of the formation you are running. For any great zone defense, you are going to need players working together and competing to get stops, and a 2-3 zone is no exception. Hands: Being active and playing with your hands up can make a world of difference when it comes to getting stops. Active hands will make your zone look more intimidating, allow for deflections, force the defense to have to throw looping passes, and ultimately help you get more stops. 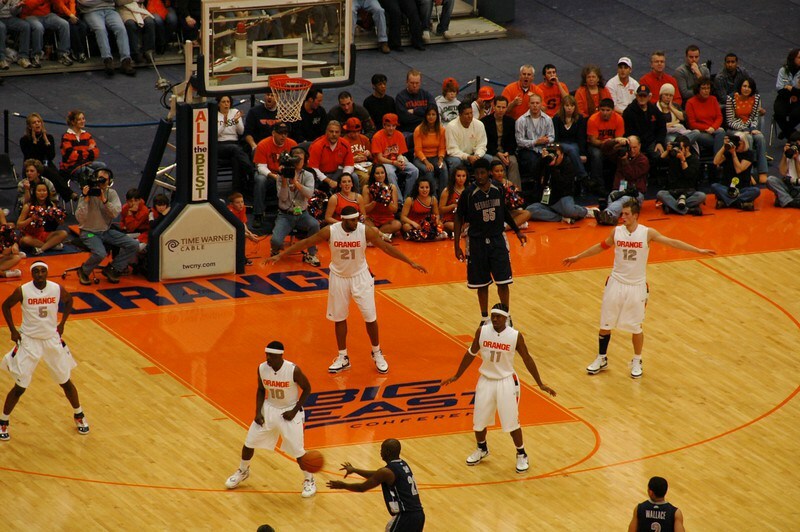 Players must be active with both their hands and arms when playing a zone defense. Communication: Because players are responsible for an area rather than a man, there are a lot more potential breakdowns when it comes to overloads, screens, etc. This means that communication between the five defenders on the floor must be at a high level. It is crucial that you are holding your players accountable for communicating every time down the floor. Zone defense, regardless of the formation, takes a lot of time and effort. It takes daily repetition for your players to develop trust in their new habits. Most kids have all played man-to-man defense and are used to certain principles, but not every kid fully gets taught the correct way to play a zone. If you want to be good or even potentially great at it, study it, break it down, and emphasize the details with your team. A 2-3 zone can be very effective, but you must treat it like any other defense and put forth the time to have success! 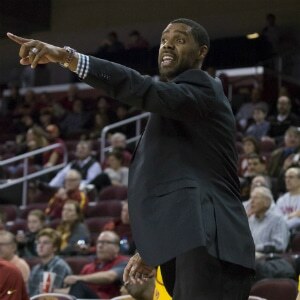 Jason Hart has been a part of the University of Southern California coaching staff since 2013. Coach Hart comes from a playing background and spent his college career at Syracuse University under legendary coach Jim Boeheim. He also played in the NBA for several NBA teams including the Bucks and Spurs. Strong message that I agree with. Athletic players can pressure and shut down the ball wherever it is requiring the attack to resort to screens and closing the attack up. With a 24 second shot clock in England it always creates pressure on the shot selection. I would like to see specific responsibilities on how to handle dead spot cutter in an overload, also when the corner man dribbles back out with ball. Jason was also a nasty defender. And I have seen him coach d at USC in practice. He has my respect.